Maoists gunned down a ruling Telugu Desam Party (TDP) MLA and his associate on Sunday afternoon when they were visiting interior village in tribal area of Araku in Visakhapatnam district in Telengana, police officials said. More than 50 armed Maoists targeted MLA Kadiri Sarveshwar Rao and former MLA Siveru Soma at around 1 pm at Nimitiputtu village under Dumbriguda mandal of Visakhapatnam district. The place is just 15 kms from Odisha border and the assailants escaped across the border. Rao was elected to the State Assembly in 2014 from Araku constituency on the Opposition YSR Congress party ticket but later switched to the ruling TDP and became the Government whip in the Assembly. He was survived by wife and two sons. “The Maoists opened fire from point-blank range first at former MLA Soma and then at the MLA, killing both of them on the spot,” DIG Visakhapatnam range Ch Srikant told the reporters. Earlier, the Maoists overpowered the two gunmen, snatched their weapons and tied them to a tree. Initially, there was discussion between the Maoists and the MLA over his mining activities in the area. The Maoists said the mining activity is damaging the forests and the environment and demanded that it should be stopped forthwith. According to the witnesses, the MLA told them that if there is any problem it could be sorted out through talks but he will not bow to any threats. 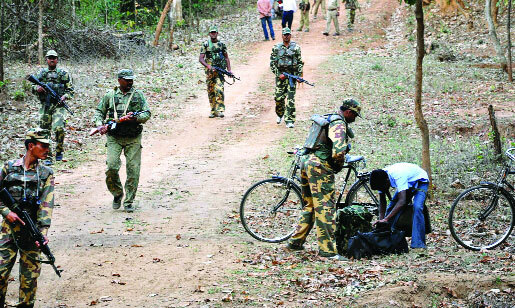 Soon after, the Maoists opened fire killing both the leaders on the spot. Later both the bodies were shifted to King George Hospital Visakhapatnam for post-mortem. Police have sounded a red alert in Andhra Pradesh and neighbouring Telangana. Authorities have asked Ministers and elected representatives not to travel in the rural areas without informing police. “We have launched a combing operation to nab the culprits. A probe is underway into the circumstances in which the attack took place”, Srikant said. Police officials suspect that the attack was led by Ramakrishna, secretary, Andhra Odisha Border committee of CPI Maoist. Ramakrishn who earlier headed Andhra State Committee had narrowly escaped police dragnet in 2005 and was largely based in Chhattisgarh and Odisha since then. Andhra Pradesh Chief Minister N Chandrababu Naidu, who is in the United State on an official visit, condemned the attack. In a statement issued through his office Naidu said, “All democratic forces should strongly condemn the dastardly act.” He recalled the services Sarveshwara Rao and S Soma had rendered for the tribal people. Leader of Opposition and YSR Congress president YS Jaganmohan Reddy also condemned the Maoist attack. It is after a lull of several years that the armed Maoists have carried out such a major attack in Andhra Pradesh and killed a lawmaker. The CPI Maoists were on the run from the erstwhile united Andhra Pradesh since late 2004 when the much- touted peace talks between the armed ultras and the then Congress party Government in the State broke down and police launched a massive crackdown killing dozens of their top leaders and armed members in various operations. The latest incident is reminiscent of killing of Congress party lawmaker Narsi Reddy and 8 others in a major attack in Narayanpet town of Mehbubnagar district on August 15, 2005. Since the State was bifurcated and Telangana was formed the Maoists were trying to regroup and return to the region and resumed their activities in the tribal and forest areas adjoining Odisha and Chhattisgarh. Police suspect that the Maoist attacked the MLA as their demand to stop the bauxite mining in the tribal areas of Visakhapatnam were ignored by the State Government. The local tribal and the Maoists were agitating for a long time to stop the mining as it was destroying the environment. Maoists had put posters in the tribal area warning the MLA against supporting the mining companies and declared that he was on their hit list. “It was a pre planned attack and somebody had tipped off the Maoists in advance about the visit of the MLA to the area”, a police official said. Rumours were rife in the tribal area for last two months that the movement of Maoists had increased and they were planning to carry a major attack.